I'm on a quest to try out every single cafe in this area because all of them are so good and so cheap and so cute! Mood Swingers Cafe was discovered by one of my friends who brought us here for her birthday. We ate like pigs and the bill was just somewhere around nine-unbelievable-hundred. And everything was so delicious! They put cheese in everything like it's free. By the time you finish your meal, you'll swear- "No cheese for at least a week". But I'm not complaining. Justifying the name of the cafe are pretty swings instead of chairs at some of the tables. The decor is very colourful with many Bollywood references on the wall. The place has a very cheerful vibe with pretty lights and neon sticky notes. We first ordered a Belgian Chocolate Shake and Oreo shake, both of which tasted pretty similar but equally good. The shakes are not too thick and don't kill your appetite. They are refreshing and rich enough. A fairly new addition to their menu is Fried dimsums (Veg/Non veg) that you can have with or without gravy. We went for Veg Fried with gravy and were put to Dimsum-heaven with the very first bite. They are super messy to eat and I loved it! The size of the dimsums is so big and the stuffing too, is quite hearty. They are just not your average dimsums. My guess is that the gravy is a mix of mayo and maybe some barbeque sauce with crunchy capsicums and carrot slices. A total must have, guys! Next up, the cheesy grilled paneer came on a stunning platter with garlic bread, whitw sauce and mustard cheese sauce. This was the kind of dish when you feel "To hell with clicking pictures, I want this inside me! " The paneer slices were seasoned with herbs and both the accompanied sauces tasted rich, creamy and delicious. However, this one was a little too salty for my taste. Would have loved it even more if the salt was right. We then ordered the Gardeners Pizza, and let me tell you, I don't usually like pizzas in most of the cafes in the area. This one however, was an exception. Maybe because they are so generous when it comes to putting cheese. 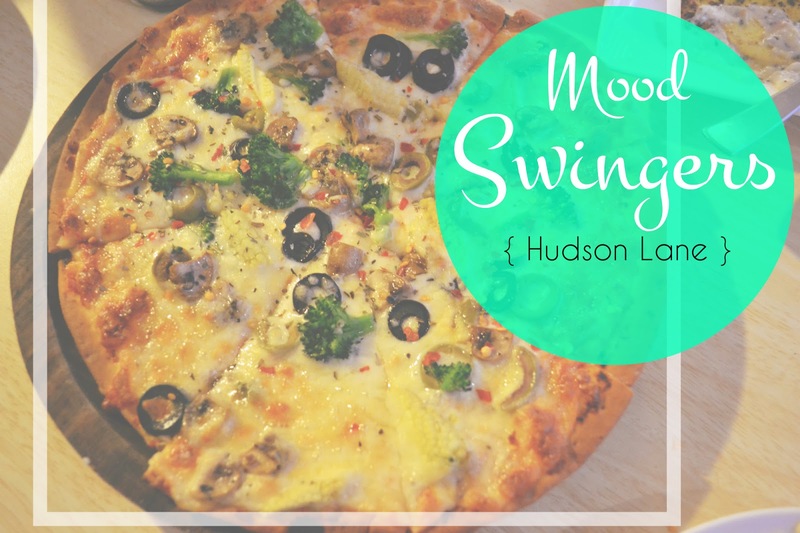 The pizza was moist and crispy with my favourite toppings- broccoli, olives, jalapenos and baby corn. We were so full by this time but just had to try the Veg Lasagna. And try, we did! Look at that beauty, how can anyone afford to miss it. It was as declicious as it looked, overleaded with veggies and creamy white sauce baked to perfection. However, this one was a little too salty as well at which point we asked the manager to please take note of the saltiness, which he very politely did. I think I've finally found a cafe other than BYD that I just might become a regular to. Mood Swingers is fresh, promising and cheerful. Big thumbs up for stuffing people with so much cheese! Looks to be a great place and food looks delicious too. Good review on them.